Immerse yourself into meditative tones of hindustani ragas which are based on ancient teachings of body-mind harmonization using sound vibrations – discover beauty and power of Indian classical music. Sitarist Arjun Verma (USA) is one of its top-class young performers, disciple of legendary Maestro Ali Akbar Khan. Arjun will be accompanied on tabla by another excellent player, tablist Florian Schiertz (Germany). Arjun Verma is a sitarist trained by Maestro Ali Akbar Khan. As a child, Arjun learned from his father, sitarist Roop Verma, himself a disciple of Ali Akbar Khan and Ravi Shankar. As a teenager, Arjun was very fortunate to study with Ali Akbar Khan for eight years, and since the Maestro’s passing in 2009, with his son Alam Khan. The combination of these influences results in a style encompassing the profound as well as exhilarating aspects of North Indian classical music. Arjun has performed around the world, including noteworthy performances with St. Louis Symphony, Houston Grand Opera, and at Prague Castle, Pattee Arena, the Fillmore, and at the United Nations in Geneva. Arjun has performed with renowned musicians in many genres, including Pandit Swapan Chaudhuri, Alam Khan, Bob Weir, Pandit Sharda Sahai, Ustad Shabbir Nisar, Nitin Mitta, Kai Eckhardt, Krishna Das, Anirban Roy Chowdhury, and Salar Nader. 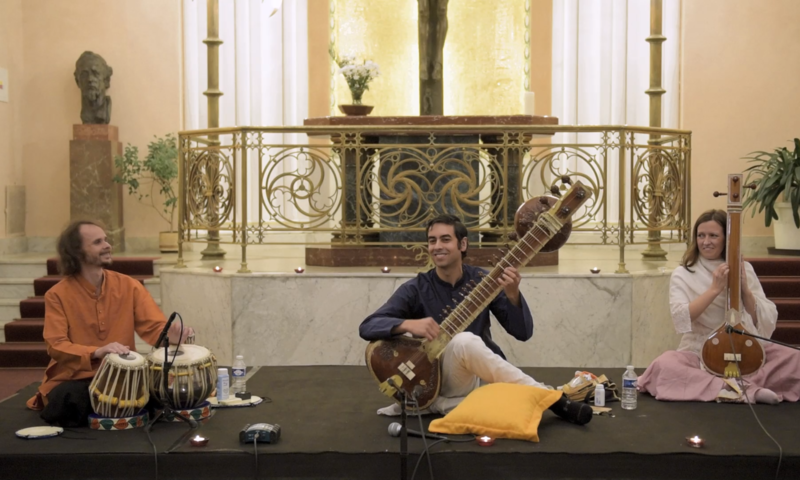 Arjun’s music has received critical acclaim from leading publications, including the New York Times, Sruti Magazine, the St. Louis Post-Dispatch, and the San Francisco Chronicle. Rag Nat Bhairav, is a variation of principal rag Bhairav, one of the six male ragas family. It is played in a devotional mood in the early morning hours. Raag Chandranandan, composed by Ali Akbar Khan is based on combinations of four evening ragas, Malkauns, Chandrakauns, Nandakauns and Kaushi Kanada. Tickets can be purchased at the concert venue before the performance or online. The ticket price is 300 CZK, children under 12 years have free admission. The concert will be followed by three-day workshop on Indian classical music in the Yoga school of Bast near Prague, which will be dedicated to harmonic and rhytmic aspects of classical ragas interpretation. Workshop will be led by Arjun Verma and Florian Schiertz in two parallel sessions. It is suitable not only for sitar and tabla players, but for all musicians interested in Indian classical music – singers, guitarists, drummers etc. Accommodation and meals will be provided on the spot. If you are interested, please write to info@sargam.cz. Nonprofit organization with the aim of gathering people interested in the Indian Classical Music and spreading awareness of its unique features in Czech lands. Would you like to help us? We are looking for sponsors and supporters. Contact us via e-mail and let us get in touch.